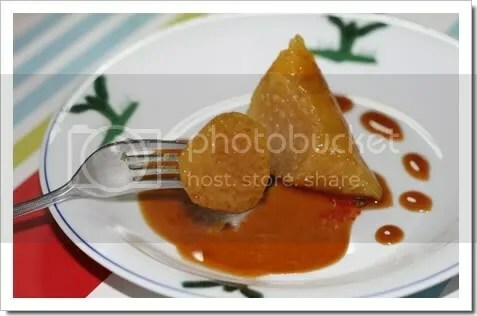 This is a very easy and unique dish to serve during Chinese New Year. 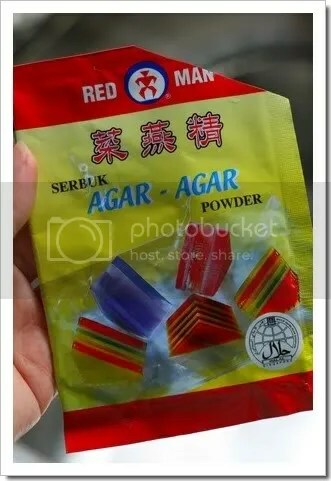 I bought the fish paste from those who sell yong tau foo in the market. That way, I do not have to debone the fish. 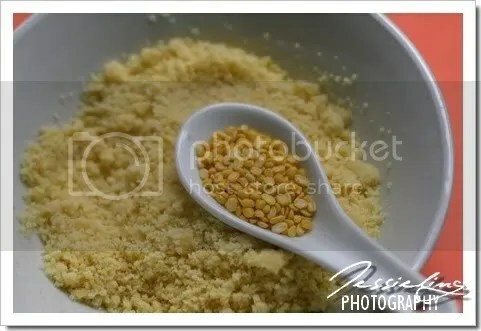 You are most welcome to make your own fish paste from scrap that is including adding sesame oil, pepper and salt to it. Mix all the ingredients together. Chop finely scallions and chili/carrot. I would prefer to use fresh chili as a little bit of spiciness really compliment the taste and also giving it a nice red colour but since I have little kiddos at home who doesn’t fancy chilies at all, so I opt it with carrot. To prepare the egg sheet, for that amount of fish paste you saw, I only can make one roll meaning I only need one egg sheet. Depending on the size of your pan but usually for 9cm pan, I only need one egg. Beat egg in a bowl with a pinch of salt. This is my term life insurance quotes secret of making a really thin egg sheet. Firstly, heat up pan as usual. Once they are hot, turn off the fire. Pour egg into pan and swirl it so that the egg will cover evenly on the pan. Turn on the fire again. Let it cool. Spread cooled egg sheet and a piece of nori sheet on a working board. Spread fish paste evenly. Roll tightly and steam them for about 15mins. Once they are done, cut while they are still hot or if you prefer, let it cool down a bit so that you won’t burn your delicate fingers. Serve with Thai chili sauce. Heyo! It’s been a while since I posted my cooking! I was actually kinda nervous with this posting since I’ve not been blogging recently. And thanks God my password is still working! Without much further ado, I made this Feta Cheese salad last weekend for one of the forum’s party that I attended. I love it this way as I find them more healthy than those mayo or thousand island stuff of salad which is very fattening. 2) One bottle of Feta Cheese in olive oil. Since I’m catering for a party, I bought the largest bottle of feta cheese. They have smaller packaging in the market too. 3) Chicken ham or you can use the left over roasted turkey breast from your upcoming Christmas dinner 😉 . Not sure about you. I have party invitations every weekend from now on till the New Year! Don’t know should be happy or sad. 4) Cashew nuts – optional but I just love this combination. Method – Combine all of the above and dig it! While I was in Singapore, I savored two version of toast that is not found in KayEl and decided to make them again for breakfast one fine morning. Co-incident, a colleague gave me a pack of Otak-otak from Muar that is still in the freezer since many donkey months ago. I reckon this frozen pack suit my taste as they are less spicy and has chunk of fishes in there but lack on aroma. What I did is defrost them at the lower compartment in the fridge and mixed evenly 2 pieces of young kaffir lime leaves that has been cut thinly. I used 1 inch thick sandwich bread instead of the normal bread which is half of the thickness. Spread otak-otak on the bread and toast them in the oven for approximately 20mins on 200C (or till done). For the kids, I’ve made them something that is non spicy. Chicken floss toast with drizzle of condense milk. 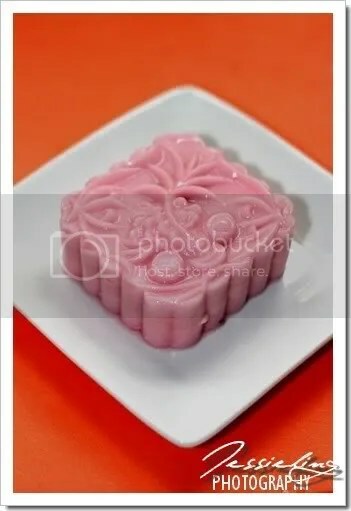 A friend from States, Phuong, whom I known thru my blog requested me to send some mooncake mould to her about 2 months ago. While buying stuff for her, I get some of the props for myself too. 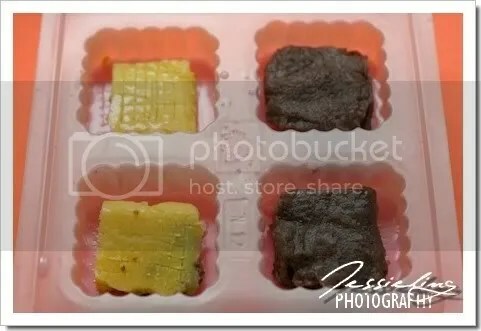 I bought 2 different design and shapes of mooncake mould and a packet of Red Man jelly powder. This is my way of cooking without refering to the cookbook. 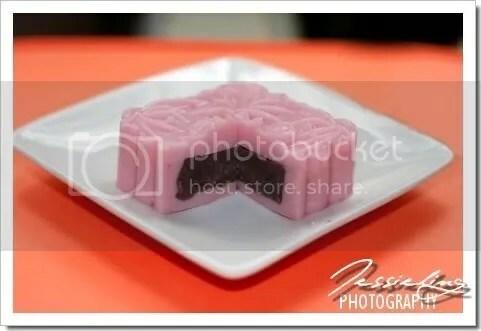 The jelly mooncake turned out quite ok but still need some room of improvement. Mashed mung beans and red beans using a shieve. Discard any husk from the red beans that can’t be mash. 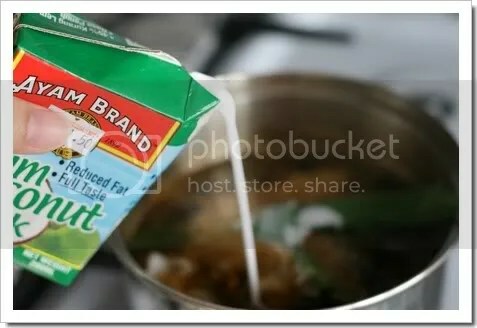 Boiled approximately (cos I just simple pour half of them in the pot) half of the 1liter water into a pot and half of the sugar into the pot. 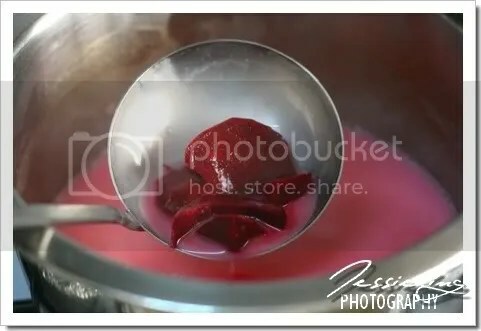 Emptied 1 packet of jelly powder into pot and stir them under medium fire till dissolved and boiled. Scoop 1 ladle of mixture into the mung beans and 1 ladle of mixture into the red beans. Stir to mix mixture evenly. Now this is a quick multi-tasking. transfer the mung beans and red beans on a plate and cool them in the freezer to save time. Back to the mixture, once boiled, emptied a box of coconut milk and stir. Switch fire to the lowest possible. Separate mixture into 2 pot with 2 different colourings. I used natural food colouring for red. That is beetroot and since I have nothing for the orange, I used edible colouring. Discard beetroot once you get the colour you desire. 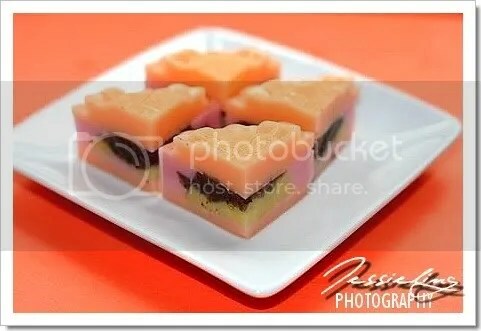 Pour mixture into your mooncake mould about 0.5cm height only. Cool them in the freezer to safe time. Remove from freezer after about 5minutes. Transfer back to freezer if mixture is not harden yet. 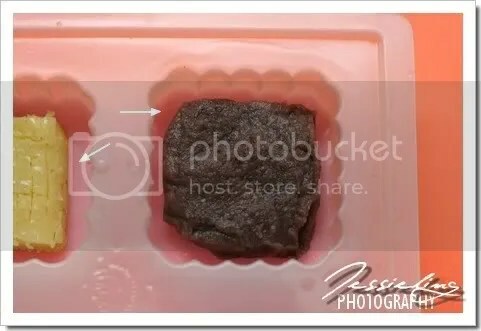 Cut out filling according to your mould size as in the picture. Place the paste on the centre. Arrow is indicating the base of the jelly. Remember to use a fork to make scarring on the surface of the jelly so that the first layer (base) and second layer will stick together. Remember your fire is still burning on low? Never let the jelly mixture cool down or else, they won’t stick to the first layer too. Now that you have finished with the paste and such, this is the time to switch off the fire. This is the full view of the mould. Pour the remaining jelly mixture in the mould covering the paste. Cool them in freezer to safe time. LOL. I am so impatient right? Towards the ending when I have not enough mixture for one mould, I just mix together what I had and came out with a multi coloured mooncake. The adults love them but my two kids discard the bean paste and just eat the jelly. Actually I don’t like the paste too. haha! 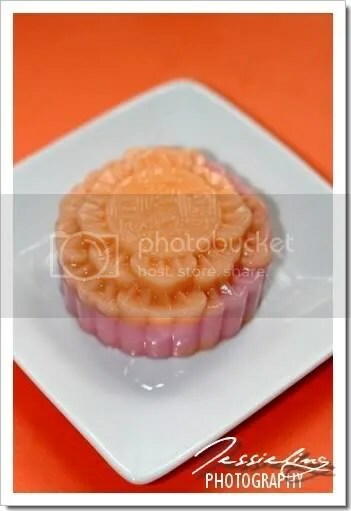 You should try making this jelly mooncake. Very easy only. Hubby’s friend bought for us a whole red snapper (I could be wrong though) salted fish from Kuantan. My first attempt is to had them (flesh only without the bone) stir-fried with rice. That was something like one month ago and I’ve totally forgot about the salted fish! So I cook them again last weekend. This is my all time favourite dish – Taugeh (bean sprout) with Salted Fish. Sliced tau kua in rectangular. Deep fried them in oil on high fire till golden yellow. 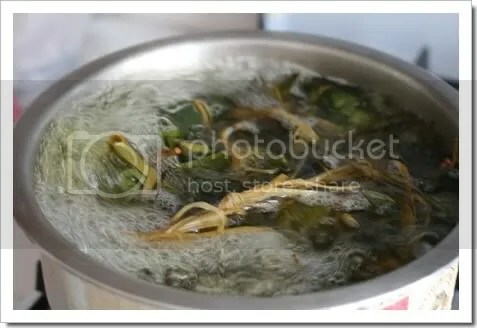 Removed from wok and using the same oil earlier fried the slice salted fish till fragrant or crispy. Removed. Discard the earlier oil. Without washing the wok, saute garlic and chives. Add in taugeh and chilies. Give them a quick stir and pour in 1/2 cup of hot water. The reason why I used hot water so that the water doesn’t take a long time to boil and not overcook the taugeh. Transfer the earlier tau kua and salted fish. Season them with 1/2 tsp of oyster sauce. Once the gravy boiled, removed immediately. Best served with rice. But I had them with porridge. That is another part of me growing up as a foochow. 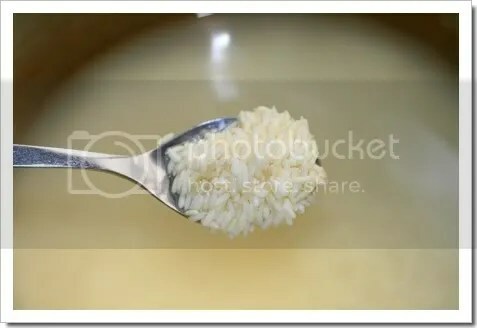 Old habit die hard – porridge for lunch and rice for dinner. 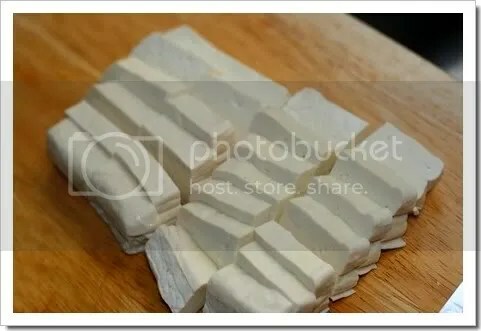 If possible, buy the glutinous rice from sundry shop and not the one like I used above as those branded packaging is not so pure. They added some rice into it which will later resulted a harder dumplings. Wash throughly glutinous rice. Soak them in clean water with 3 teaspoons of alkaline water added. I soak mine for 6 hours (9am to 2pm). The colour will change yellowish instantly. As usual, wash the bamboo leaves and the string. Discard water from glutinous rice and you can start to wrap the dumplings. Place 2 bamboo leaves back to back. Shape them into a funnel using one third of the length and work your way up. Cut away the hard stem on the glutinous rice. You know making dumplings takes a great deal of skills, patience and free time but of course practise makes perfect too. Filled up a big pot of water enough to cover the dumplings. Bring water to boiled. Add another 3 teaspoons of alkaline water into the boiling water before adding your dumplings. Cook for about 3 hours. Add more water if the liquid drop below the dumplings level. Once done, hang to dry. Put a little water in sauce pot. 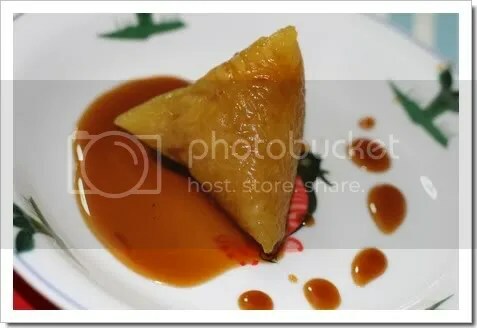 Cut coarsely palm sugar so that they will dissolve faster. Cook under low fire all the time. Once sugar dissolve, add in coconut milk. Cook till sugar thicken. That took me a good 1 hour! I can eat 3 dumplings in a go. They are so lip-smacking good especially the palm sugar. You can try cooking kaya too if you have the time. Seriously I don’t that is why i resorted to palm sugar instead. The actual day for Duan Wu Jie falls on 7th June 2008. Early Happy Duan Wu Jie to all since I won’t be around that day. What happen to the weather this few days? I felt myself living in an oven! Hot weather makes me moody too and when I am moody I tend to loose my temper easily. Bad! So, on a hot and lazy day, I have it easy in the kitchen – Red Snapper fish porridge. Cook rice in low fire for about 1 hour or till rice breaks. Marinate fish fillet with soya sauce and pepper. Since fish don’t require longer cooking time, I add them in five minutes before the cooking end. Season porridge with chicken granules. Leave them in the pot for about 10 to 20 minutes before consuming. Garnish with young ginger strips and spring onion. Optional, add in sesame oil and pepper.